The contest judges carefully monitored eye contact, inflection, depth of knowledge and relevance of topic as they listened to 18 students deliver speeches during the recent Concerned African American Parents annual Oration Contest at the Teacher Resource Center. Students confidently shared troubling issues they had witnessed, and in some cases been victims of, cited data on their subjects and then detailed their plans for positive solutions. Participants impressed the packed room of parents, family members, school district administrators, teachers and community leaders with their insights into current issues such as cyber bullying, smoking, littering, the need for unity, use of the “n” word, homelessness, negative perceptions and education. The judges were Board of Education Vice President Felton Williams, Stevenson Elementary School Principal David Zaid, CAAP Founder Ninette Richardson, and Cal State Long Beach’s Director of University Outreach and School Relations Valerie Bordeaux. Former Board of Education President Bobbie Smith praised the students and donated two of her famous, freshly-baked sweet potato pies for the drawing in celebration of Black History Month. 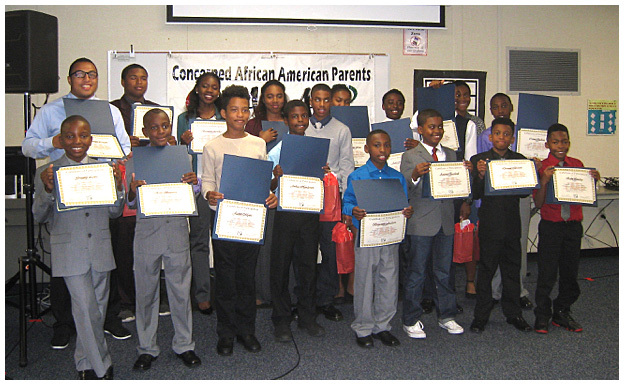 WINNING ORATORS – Participants in the annual Concerned African American Parents Oration Contest proposed positive solutions to societal issues such as homelessness, cyberbullying and littering. The students earned certificates, prizes and goodies.